Apple’s official iOS App Store is well known for its strict code review of any app submitted by a developer. This mandatory policy has become one of the most important mechanisms in the iOS security ecosystem to ensure the privacy and security of iOS users. But we recently identified an app that demonstrated new ways of successfully evading Apple’s code review. This post discusses our findings and potential security risks to iOS device users. 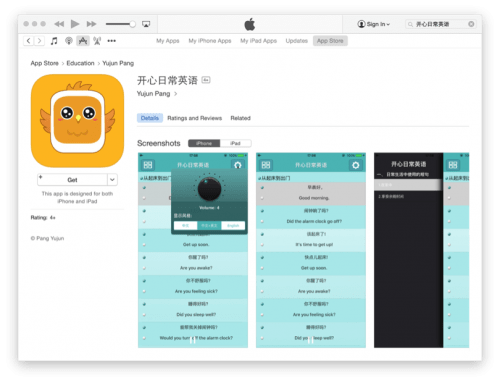 The app we identified is named “开心日常英语 (Happy Daily English),” and it has since been removed by Apple from the App Store. This app was a complex, fully functional third party App Store client for iOS users in mainland China. We also discovered enterprise signed versions of this application elsewhere in the wild. We had not identified any malicious functionality in this app, and as such we classified it as Riskware and have named it ZergHelper. It provides installation of modified versions of iOS apps whose security can’t be ensured.. It abuses enterprises certificate and personal certificates to sign and distribute apps, which may include code that hasn’t been reviewed, or abuse private APIs. 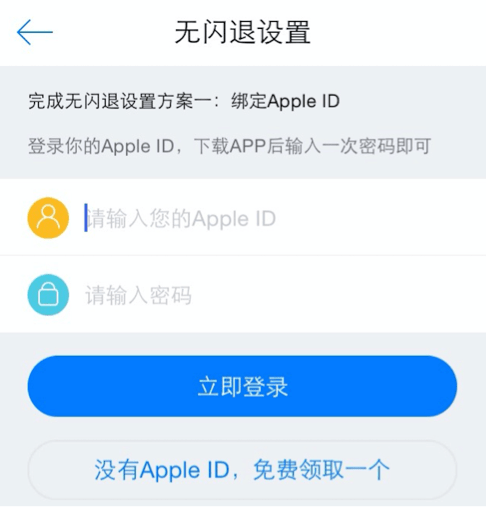 It asks user to input an Apple ID while it also shares some Apple IDs to users. It will log in to an Apple server using these IDs to perform many operations in background. Its author is trying to extend its capabilities via dynamic updating of its code, which could further bypass iOS security restrictions. It uses some novel techniques that are sensitive and risky – techniques that could be used by other malware to attack the iOS ecosystem. The app was made available in the App Store on October 30, 2015. However, nobody appeared to have noticed ZergHelper’s hidden functionality until February 19, 2016, when a user created a post in V2EX (a Chinese developer forum) to discuss it. We shared our findings with Apple on February 19, and Apple removed the app from the App Store later that day. 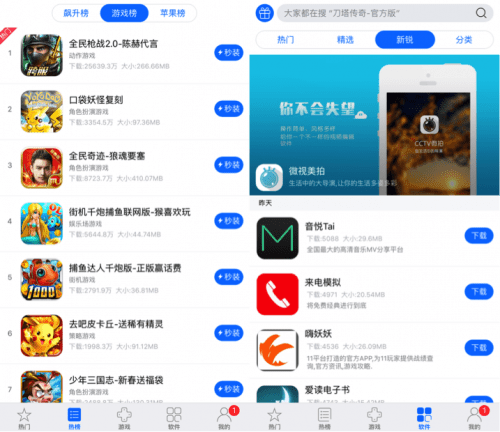 ZergHelper’s main functionality appeared to be to provide another App Store that includes pirated and cracked iOS apps and games. The app was developed by a company in China that named its main product “XY Helper”. ZergHelper was the non-jailbroken and “official App Store” version of this product. In addition to its abuse of enterprise certificates, this riskware used some new and novel approaches to install apps on non-jailbroken devices. It re-implemented a tiny version of Apple’s iTunes client for Windows to login, purchase and download apps. It also implemented some functionalities of Apple’s Xcode IDE to automatically generate free personal development certificates from Apple’s server to sign apps in the iOS devices – which means the attacker has analyzed Apple’s proprietary protocols and abused the new developer program introduced eight months ago. ZergHelper also shares some valid Apple IDs with users so that they don’t need to use their own IDs. ZergHelper’s code is complex and it’s still unclear whether it would steal account information and send it back to server or not. The app did send some device information automatically to a server for statistic tracking. The authors appeared to be trying to use the programming language Lua to make the app more extensible. Specifically, ZergHelper’s use of the framework means its code could be remotely updated without Apple’s further review. We also identified over 50 ZergHelper apps that are signed by enterprise certificates. These apps were spread by authors in different channels. 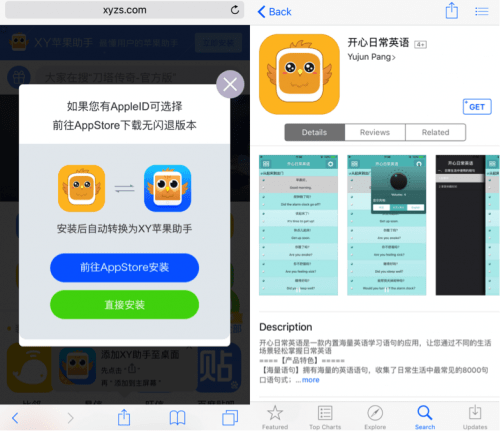 ZergHelper was designed to be installed in this way: if an iOS user accessed XY Helper’s official website from China, the top advertisement banner would prompt a page saying that you could go to App Store to install their product “XY Apple Helper” (left of Figure 2). By clicking the button, the official App Store is automatically opened and the “Happy Daily English” app’s page is shown (right of Figure 2). The original “Happy Daily English” app is open-sourced and hosted on OSChina as a project named “HappyEnglishSentences8k”. ZergHelper authors compiled it and embedded their own risky code. There appear to have been at least three people jointly developing it using the usernames of “xi”, “zhang” and “zhangzq”. The project’s internal name was XYFactory and the app’s internal name was “AppStore_4.0.1”. If you were to browse the app using the desktop browser or by iTunes client on any platform, the app’s name would be shown as “开心日常英语 (Happy Daily English)”. However, once it was installed on an iPhone or iPad, the name became “XY助手 (XY Helper)” with the same logo, just like the value of CFBundleDisplayName in the app’s Info.plist file (Figure 3). Our analysis suggests the authors inputted a different name when submitting the app to Apple through web form and Apple’s review process didn’t identify that inconsistency. When the app launched, it would connect to the URL interface[. ]xyzs.com immediately, and take different reactions based on result of the HTTP request (Figure 4). The webpage was configured to return a 404-not-found error if the access comes from an IP address outside of mainland China. In this situation, the app would only display an English study interface (left of Figure 5) – no other functionality was provided to users in these regions. We don’t know where the App Store reviewers are located. If they are not located in mainland China, this method could trick them into seeing a legitimate app. Even if they’re in China, the author could just shut down that webpage during the review period so that reviewer could not see the actual functionality through an analysis of its behavior. For users in China, the different user interfaces would appear (right of Figure 5). Then the app will guide to install two configuration profiles that it claims are for “resolving stability issues” but will actually install a device enrollment challenge and a web clip (Figure 6). These profiles were signed with a certificate of “xyzs.com” which was issued by Go Daddy Secure Certificate Authority on December 2, 2015. Note that the device enrollment challenge is used to enroll the device to related MDM (Mobile Device Management) system. The app provided functionality of directly installing plenty of iOS apps and games to the device. It has pages for hot apps, hot games, top grossing apps, etc., just like the official App Store (Figure 7). The only difference is, all apps or games provided by ZergHelper are free, which means, they are likely pirated versions of the legitimate apps. In the settings tab, for devices using pre-9.0 versions of iOS, a user could also input an Apple ID and password. The password would be remembered by the app. There’s another button used for “I don’t have an Apple ID. I would like to receive one for free” (Figure 8). We have not identified where these Apple IDs came from. ZergHelper used unique ways to build a third-party App Store for non-jailbroken iOS devices. Each of them could be used to spread pirated or cracked iOS apps. Two of them are new methods of getting past App Store review that we haven’t previously observed. Hence the app is trying to act as an iTunes 12.0.1 client running on Windows 7 system. We’re still not very clear in which ways ZergHelper used these functionalities. It’s possible that they were used for the Apple ID given by users, or by the “free” Apple ID provided by the app itself. The most surprising approach to installing apps on non-jailbroken devices is how ZergHelper abused free personal development certificates. Previously, Apple only offered iOS development certificates for registered developers who paid an annual fee. This kind of certificate is necessary for anyone to sign an app and then run it on a physical device. From June 2015, Apple began to provide a new program that allows anyone with an Apple ID to receive a certificate for free. The functionality is embedded into Xcode since its 7.0 version and so far Xcode is the only official way to use this feature. However, ZergHelper could have acted as Xcode to receive a valid personal development certificate from Apple’s authentication servers, too. Apple doesn’t disclose how this process works and how Xcode is implemented. Therefore, we think someone has reverse-engineered Xcode in detail to analyze this part of code so that they can implement exactly the same behaviors with Xcode – in effect, successfully cheating Apple’s server. Using the development certificate, ZergHelper could sign other iOS apps on iOS devices and then install them. There are limits on the number of iOS devices that can be authorized to use each certificate. Previously, people worried about whether the free certificates would be abused by someone to install pirated apps, but this technique shows abuse in a wide-ranging and automated way. The information was posted on a famous security forum in China in February 19, and was then deleted on February 20. 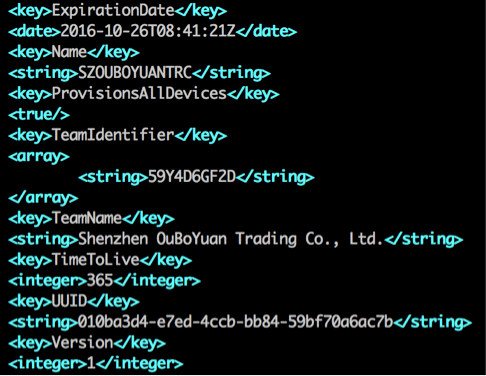 ZergHelper also abused enterprise certificates in a manner similar to other previously identified iOS malware, including WireLurker, YiSpecter and TinyV. In the app, these kinds of apps are tagged with “install in a second.” ZergHelper used the itms-service protocol for these apps’ installation. Compared with previous malware, the main difference in ZergHelper is that it would not only download itms-service plist file from C2 server, but it could also open a local port to install some apps onsite. This feature may have been designed for apps signed by personal certificates. Apple’s App Store was just one “channel” through which ZergHelper was distributed. The authors also developed other versions that are all signed by different enterprise certificates. These versions were distributed through different channels and could be installed to non-jailbroken devices. For example, when you access XY Helper’s website, you could choose to install it from the App Store or directly from their server. We found over 50 ZergHelper samples signed by nine different enterprise certificates. In their “xyChannelId.plist” files, the author specified 32 different channel IDs and 33 different channel names. Previously there have been some malware (e.g., FindAndCall) or Proof-of-Concept apps (e.g.,Jekyll) that successfully made it into the official App Store. The most recent cases areXcodeGhost and InstaAgent. Compared with those, ZergHelper has more user interfaces and more significantly suspicious code characteristics. Apple typically doesn’t disclose any technical details regarding how its reviewers check apps to confirm they are not malicious. But ZergHelper demonstrates new techniques that can evade Apple reviewer scrutiny. Since WireLurker, there have been more malware or evasive applications installed on iOS by abusing enterprise certificate. The biggest risk around this issue is the combination of enterprise certificate and private APIs. YiSpecter and Youmi have abused private APIs to collect private information on iOS. ZergHelper took another step to automatically generate development certificates for free. This is of concern because the abuse of these certificates may be the first step toward future attacks. In the underground market for iOS tools, Apple IDs have become more and more important. In recent months, we’ve seen malware designed to steal Apple IDs (e.g., KeyRaider), take money from them (e.g., AppBuyer) and share them (e.g., YiSpecter). Some attackers ransom the stolen Apple IDs or phish for them. ZergHelper’s functionality also relied on valid Apple IDs. We’re still not certain whether ZergHelper could send stolen Apple IDs back to its server or not. Note that ZergHelper would provide free Apple IDs to its users, and we do not know from where these IDs originated. Use of Apple IDs only continues to grow, especially when we consider the amount of private data stored in iCloud and on iPhones and iPads. Apple requires every single update to an app in the App Store to be reviewed again before publishing. For ZergHelper, re-review increases the possibility of exposure. The authors appear to have tried to resolve this problem by using a scripting language. ZergHelper used an open source project called wax, “a framework that lets you write native iPhone apps in Lua.” In the app, there’s a XYLib.lua file that only contains two functions so far. This Lua plugin will be loaded and executed when the app first launches. Through the wax library, this script could invoke many methods in the Objective-C runtime. Apple disallows iOS app from dynamically loading new code or dynamically updating themselves. This is an important and useful security mechanism to mitigate the risk of some kinds of vulnerabilities and some malware. However, frameworks or SDKs like wax provide another way to bypass the restriction. We reported the issue to Apple on February 19 and Apple removed the app from the App Store on February 20. For iOS users that have installed “开心日常英语” from App Store, or found “XY助手” in your devices, we suggest you uninstall it. We also suggest that users check profiles in their iOS devices (by Settings -> General -> Profiles & Device Management). If there’s any profile from “xyzs.com”, you should delete it immediately. We greatly appreciate “i_82” for his help during the analysis. We also would like to thank the author of Surge for creating such awesome tool that greatly helped our analysis of ZergHelper. Last, we thank Ryan Olson and Chad Berndtson from Palo Alto Networks for assistance in developing this report.